Every sewer or knitter, beginner or advanced, needs good tools to fully enjoy their craft. Take advantage of the great coupons and deals on notions this time of year and fill those stockings with essential tools of the trade. While there are many that enhance sewing and knitting projects, some have been known to save sanity! Today we will share a few of the BEST sanity-savers! It’s really imperative to use sharp, well-made scissors. There is NOTHING worse than working with a dull set. I own Gingher dressmaker shears that I keep in its case and I (literally) don’t let anyone touch it. I also have one Fiskars for cutting fabric, and another small set by my machine at all times to snip threads or clip a seam. I can’t believe I used those tiny pins years ago and pulled them out of a plastic box. This is one of the best ideas EVER! And, when the pins go overboard on the floor, just run the magnet over to pick them up. I keep this invention at my side at all times. It’s essential for measuring and turning up hems, waistbands, edges, etc. It seems I am constantly measuring something as I sew. Does your thread twist and tangle by the time you’re halfway into your hand sewing project? After your needle is threaded, pull the thread through the little channel a couple of times. It will keep your thread twist- and tangle-free as your work. Voila! Keep handy for the times when alterations are needed, or a quick mark is desired. Pins fall out, and pens stain! Note: there is also a purple version that is washable. It’s better for marking darts, hems or points when pattern cutting, but only use on washable fabrics. This is my newest find and it is so helpful when sewing thick fabrics to avoid ending up with an uneven seam end. Sewing felted wool, (see earlier post Here) is one example of a great time to use this foot. Most quilter’s use them to avoid fabrics shifting when layered. It’s a dream! Sergers do not back stitch like conventional sewing machines. While there are other methods to secure your seam, this is the best. Put a dab on the end of the seam, let it dry and it stays secure. It’s also fab-u-lous for any small ravel or hole. Clip just a little too far? Just a drop! I’ve been sewing temporarily in a room with laminate flooring. I was going crazy with my foot pedal always sliding and heading away from me. I found this simple, convenient solution. Take some rubber drawer liner or rug underlay and cut in a square. Cut another piece to set under your sewing machine, and another for your serger. Awesome! While these aren’t the cheapest needles on the market, the Clover Takumi Bamboo Knitting Needles are much nicer to work with and worth the small investment if you plan to do more than a small project. These needles are less slippery than metal knitting needles, making the needles themselves easier to hold as well as preventing the yarn from slipping off the needle. Keeping one or two crochet hooks in your knitting bag is critical for solving two common problems. First, if you accidentally drop a stitch, a crochet hook makes picking up this stitch much easier. Second, almost every knitting project requires you to finish by using a crochet hook to weave in all loose ends. I have a couple different hook sizes to use depending on the weight of my yarn and stitch size. I adore these clover crochet hooks with the ergonomic grips, but unfortunately don’t have any in my stash yet! When you have a pattern that requires you to “hold stitches” and then pick them up later, stitch holders make the job much easier. Some examples of uses include knitting a mitten thumb, sweater sleeve, turning the heel of a sock, and creating a cable stitch. In full disclosure, I don’t have any of these ;-( But every time I do a project, I use little yarn loops as a substitute and think about how much easier they would make my life as I often stare at my knitting trying to find where my ring markers are! So, pick some up for yourself before you do any projects that require marking an increase or decrease location for repeated rows. Point protectors are little rubber caps that you put on the end of a double pointed needle (DPN) to convert the needle to a single pointed needle. 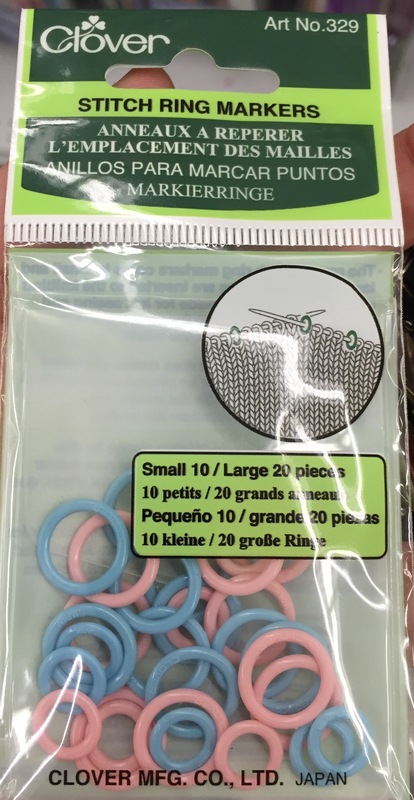 More importantly, these little caps help your stitches from falling off the end of the needle when you have a needle full of stitches or are storing your project! There are many different types of tape measures out there, and if you have a soft vinyl one, that will certainly do the trick! I prefer a retractable one though for ease of use and storage. This retractable owl tape measure from Joann Fabrics (pictured) is a favorite with Elise who often wants to play with my tools. A needle and stitch gauge is great to verify the size of your needle (important if the writing on the needles has worn off, which often happens with metal needles… another reason to buy the clover bamboo needles above). Additionally, Susan Bates Knit-Chek makes checking your stitch size – usually the number of stitches and rows that appear in a square inch of knitting. Both metal and plastic Darning needles are great for stitching pieces of knitting together. They have a large eye for easily threading the yarn and blunt tip. I used a darning needle to stitch up the arm seams on Janie’s knitted baby sweater with hood. That’s our sanity-savers for today. As we move ahead on our journey, we will undoubtedly have more, and will share the love! Until then, happy shopping! All good helpful items. I have collected all and used them thru the years. Bamboo needles are great, as are stitch markers and rubber tips..and the drawer liner plastic is also a great idea to keep your machine in place. All beginners should print this tutorial and save it! Thanks M and S !